Tennessee fishing offers many opportunities to catch the fish of your dreams. From giant stripers, to huge bass, boatloads of big crappie and huge walleyes...to monster catfish. Tennessee sports a million surface acres of water for all your fishing interests. Big lakes, small ponds, streams, creeks and rivers are scattered throughout the state. Here, you can fish for largemouth bass, smallmouth bass, spotted bass, redeye bass, channel catfish, flathead catfish, blue catfish, black crappie, white crappie, walleye, rainbow trout, cutthroat trout, brook trout, brown trout, lake trout, bluegill, flier sunfish, green sunfish, longear sunfish, pumpkinseed sunfish, redbreast sunfish, redear sunfish, rock bass, spotted sunfish, warmouth, white bass, yellow bass, yellow perch, stripers, bowfin, chain pickerel, longnose gar, muskie, northern pike, paddlefish, sauger, saugeye and spotted gar in local lakes, rivers, ponds and/or streams. This chart shows the major fishing waters in TN, cross referencing these waters with the major types of fishing to be found in each of the lakes and reservoirs. For a more complete list of fish species in Tennessee, see the list below, which also includes state records. Boone Lake is a 4,500-acre lake in the north-central part of the state, at Bluff City, TN. Calderwood Lake is a 514-acre reservoir on the southeast Tennessee border with NC, 20 miles south of Maryville, TN. Center Hill Lake is an 18,000-acre lake in the north-central part of the state, at Silver Point, Tennessee. Cheatham Lake is a 7,400-acre lake in north-central Tennessee, half way between Clarksville and Nashville. Cherokee Lake is a 30,000-acre lake in the northeast part of the state, at Jefferson City, TN. Chickamauga Lake is a 35,000-acre lake in the southeast part of the state, at Chatanooga, TN. Chilhowee Lake is a 1,750-acre lake in the southeast part of the state, at Chilhowee, TN. Cordell Hull Lake is a 12,000 acre lake in the north-central part of TN, at Granville. Dale Hollow Reservoir is a 28,000-acre lake in Kentucky and Tennessee on the northern border of the state, near Oakley, TN. Douglas Lake is a 30,000-acre lake in the northeast part of the state, at Dandridge, TN. Fort Loudoun Lake is a 14,500-acre reservoir in east-central part of the state, at the southwest outskirts of Knoxville, TN. Fort Patrick Henry Reservoir is a 872-acre reservoir in northeast Tennessee, 5 miles south of Kingsport. Great Falls Lake is an 1,800-acre lake in central Tennessee, at Rock Island. J. Percy Priest Lake is a 14,200-acre reservoir in the north-central part of Tennessee, on the northeast outskirts of Nashville. John Sevier Reservoir is a 305-acre lake in the northeast corner of Tennessee, 30 miles west of Kingsport, TN. Kentucky Lake is a 160,000-acre lake in Kentucky and Tennessee on the northern border of the state, at Camden, TN. Lake Barkley is a 58,000-acre lake in Kentucky and Tennessee on the northern border of the state, at Dover, TN. Melton Hill Lake is a 5,700-acre lake in the northeast part of the state, 4 miles southeast of Oak Ridge, TN. Nickajack Lake is an 10,370-acre lake in the southeast part of the state, at Guild, TN. Normandy Lake is a 2,500-acre lake in the south-central portion of the state, 5 miles from Manchester, TN. Norris Lake is a 34,000-acre lake in the northeast part of the state, at Lake City, TN. Ocoee Lake is a 1,900-acre lake in the southeast corner of the state, at Ocoee, TN. Old Hickory Lake is a 23,000-acre lake in the north-central part of the state, at Gallatin, TN. Parksville Reservoir is a 1,900-acre lake in the southeast corner of the state, at Ocoee, TN. Percy Priest Lake is a 14,200-acre reservoir in the north-central part of Tennessee, on the northeast outskirts of Nashville. Pickwick Lake is a 43,000-acre lake on the southern border of Tennessee, at Red Sulphur Springs. 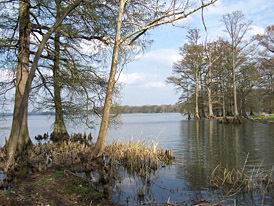 Reelfoot Lake is a 15,400-acre lake in the northwest part of the state, at Samburg, TN. South Holston Lake is a 10,000-acre lake in the northeast part of the state, at Harr, TN. Tellico Reservoir is a 15,500-acre lake in the southeast part of the state, at Lenoir City, TN. Tims Ford Lake is a 10,500-acre lake in the south-central part of the state, at Winchester, TN. Watauga Lake is a 6,400-acre lake in the northeast part of the state, at Fish Springs, TN. Watts Bar Lake is a 39,000-acre lake in the southeast part of the state, at Grandview, TN. Woods Reservoir is a 4,000 acre lake in the south-central part of TN, 4 miles from Tullahoma, TN. Plenty of shallow cover awaits anglers. Acquire a Tennessee fishing license here. Information about fishing in Tennessee is also available at the Tennessee Wildlife Resources Agency website. Visit AA-Boats-Boating.com to find information about fishing boats in Tennessee and other boating information. Excellent largemouth bass, smallmouth bass, spotted bass and redeye bass fishing awaits anglers in TN. Quality and quantity in a beautiful state. What more could one ask? We are happy to post photos, stories and/or articles about your fishing experiences here in TN. For kids fishing pictures, we have a special youth fishing section.